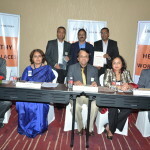 Bangalore, November 12, 2013: Nine companies based in India have received recognition for their workplace wellness initiatives with new Healthy Workplace awards from Arogya World, a global health non-profit organization with a domestic presence in Bangalore. Winners were awarded Gold, Silver and Bronze awards at a gala presentation ceremony held in Bangalore this evening. 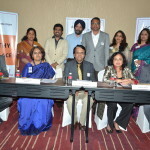 Dr Satish Chandra, Director – NIMHANS was the chief guest. This is the first step to meet Arogya World’s 2013 Clinton Global Initiative (CGI) Commitment to Action. All Arogya World’s partners on this Commitment were present at the event today – Public Health Foundation of India, Aon and NationWide – The Family Doctors. This year’s Healthy Workplace award winners included iGATE, Wipro GE Healthcare, Reliance Infrastructure (Mumbai Transmission), MTR Foods, Emami Limited (Abhoypur), Infotech Enterprises Limited, Myntra Designs, Quinnox, and Aon which together have a pool of more than 50000 employees. With an external score-card and a formal assessment process, the intent of the program is to encourage companies to meet high standards for workplace wellness and chronic disease prevention and motivate others to follow suit. In addition, Arogya World will offer Healthy Workplaces innovative mHealth and lifestyle coach-led diabetes prevention programs, to help companies further their commitment to employee health. The Healthy Workplace award process is efficient and transparent and matches international award models for integrity and rigor. It requires the company to review Arogya World’s Healthy Workplace criteria, do an initial self-assessment and submit an application listing its wellness efforts. This is followed by a half-day interactive site visit and formal assessment by a 3-person team (made up of Arogya World, Aon and NationWide representatives who provide broad cross-industry and health perspectives). The award level is determined based on objective scoring mechanisms, and is announced right after the site visit. Assessors were impressed with the many ways this year’s Healthy Workplaces met the different criteria. For example companies met the No Tobacco use requirements with a documented no-smoking policy, and enforcing no smoking on campus, by providing counseling or nicotine replacement therapy to dissuade smoking, and in some cases, reimbursement, or by spreading awareness of the dire consequences of tobacco use, or conducting research on ROI of quitting smoking or even resorting to the simplest method of physical search to ban tobacco use. The World Health Organization (WHO) has reported that approximately 80% of heart disease and diabetes and 40% of cancers can be prevented by following a healthy lifestyle and avoiding the use of tobacco, eating healthy food and increasing daily physical activity. Prevention is at the core of Arogya World India Trust’s work. Arogya World’s previously established Healthy Workplace Criteria (http://www.arogyaworld.org/our-work-in-india/healthy-workplaces/healthy-workplaces-criteria/) institutionalized awards at three levels: Bronze, Silver, and Gold. Companies that met 80% of the criteria for a specific level that include: Ban Tobacco Use, Healthy Eating, Physical Activity, and Work Life Balance, amongst others, qualified for the award. 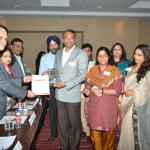 Nine companies based in India have received recognition for their workplace wellness initiatives with new Healthy Workplace awards from Arogya World. — in Bangalore, Karnataka, India. 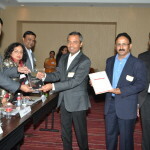 Mr. Ravi Mani, Senior VP – OE & team, iGate Global Solutions Ltd.
Mr. Mayank Bhatnagar, Director, Human Resources, WIPRO GE Healthcare, accepts the award with members of his team. Arogya World (www.arogyaworld.org) is a global health non-profit organization, committed to changing the course of chronic disease, one community at a time. Arogya means ‘good health’ in Sanskrit and denotes living life without disease. The organization believes deeply in prevention and is implementing programs for diabetes prevention through lifestyle changes in schools, workplaces and the community, in India. mDiabetes which reached 1 million Indians with text messages on diabetes and its prevention, is a Clinton Global Initiative Commitment the organization has just completed. 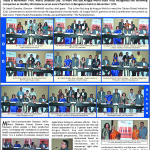 To further advance this work, Arogya World India Trust has been set up in Bangalore.